Reverend Jacob M. Koehler, founder of Scranton School for the Deaf. Had it not been for an attack of spinal meningitis in childhood, Jacob Koehler's (1860-1932) world, and the world of special education in Pennsylvania schools, would have been very different. Born into a studious family in York, Pennsylvania, Koehler lost his hearing at the age of twelve, and in 1872 entered the world of Deaf culture. At the time, the only facility in the Commonwealth able to offer Koehler a chance to continue his education was the recently established Pennsylvania School for the Deaf in Philadelphia. In 1877 Koehler entered what became Gallaudet College with the intention of becoming a minister. Two years later, however, family troubles and financial difficulties persuaded Koehler to abandoned his studies and return to Scranton, where he soon answered the call of parents to establish a school for deaf children. Originally known as the Pennsylvania Oral School for Deaf Mutes, the school opened in 1880 in a downtown church basement. Eight deaf children made up the first class. As the name suggested, the institution's approach to deaf communication emphasized mastery of spoken English, usually through lip-reading or what is today called "speech-reading." Alexander Graham Bell, inventor of the telephone and other auditory devices, was among the ardent champions of the oral approach to deaf learning. At this time, sign language was under growing criticism as an obstacle to social inclusion and a hindrance to a productive life. Koehler himself was bilingual (fluent in four languages), and equally comfortable with spoken or signed English. As the academy's reputation grew, the school moved to a ten-acre site donated by a local coal company. The Scranton School was part of an expanding network of specialized institutions created to assist young children with disabilities to acquire the education and skills needed to live productive lives. This network included the Pennsylvania Institution for the Instruction of the Blind (established 1832), which became the Overbrook School for the Blind in 1946, and the Western Pennsylvania School for the Deaf (established in 1869). Usually supported by private charitable interests, these schools were not without their critics, some of whom felt the "separateness" reinforced prevailing social stigmas. Critics also worried about the absence of regular family influence. 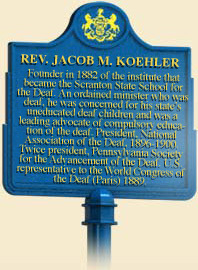 After resigning his position as principal in 1881, Koehler began a long career as a roving teacher and evangelist to the deaf in the Episcopal Diocese of Central Pennsylvania. He also resumed his seminary studies–only the fourth deaf person admitted to an American theology school–and was ordained an Episcopal priesthood at Christ Church, in Reading, Pennsylvania. Despite regular parish duties, Rev. 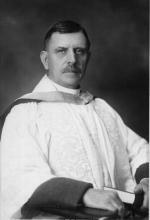 Koehler's deaf apostolate continued over the next four decades. Even with a growing family, Koehler was the inveterate traveler, rising to international prominence as an Episcopal priest and disabilities advocate. Close to Revs. Thomas Gallaudet and Henry Syles, whom he succeeded as vicar of All Souls' Church in Philadelphia, Rev. Koehler became one of the most effective interpreters of Deaf culture to a larger hearing audience. One of Koehler's proudest moments came in 1895 when Gallaudet College awarded him an honorary degree for his advocacy work. He was also plagued by controversy, including his resignation from All Souls' in 1904 and fifteen years of relative isolation before his return to prominence. During these same years, an expanding network of private and public schools for the hearing impaired went through profound changes. Expanded state supervision of vocational and special education, and changes within deaf culture itself, transformed the educational and social experience of the hearing impaired, as well as blind and learning disabled children. As the need for services grew, Pennsylvania's educational establishment began to assume greater responsibility. By 1916 the Commonwealth had assumed supervisory control over the Scranton school. The larger and more prominent Western Pennsylvania School for the Deaf and the Pennsylvania School for the Deaf retained their administrative independence, but accepted state reimbursement of tuition chargers. Ironically, the rise of publicly funded deaf education services threatened the very existence of specialized separate schools for deaf children. The begrudging acceptance of American Sign Language after a long struggle with other modes of communication also required basic adjustments in pedagogy and curriculum. One of the great untold stories in the social history of education is the experience of children who were sent by their families to private and state-supported institutions. The pain and isolation they experienced was counterbalanced by the practical education that helped them navigate the world outside. Ironically, specialty schools for the disabled reinforced the sense of separateness will building strong bonds of community–a particular subculture bound to the experience of living with a disability. After more than a half-century of missionary work–educational and church–Jacob Koehler died at the age of seventy-two at his home in Olyphant, Pennsylvania. A past president of the National Association of the Deaf and the Pennsylvania Society for the Advancement of the Deaf, Rev. Koehler was extolled in newspaper obituaries "as an orator and writer, he was fluent, graceful, and erudite." Pennsylvania Institution for the Instruction of the Blind, circa 1838. Like other institutions for the deaf and the blind, the school Koehler founded in Scranton evolved with the changing times. In 1976, the school changed its name to the Scranton State School for the Deaf, and abandoned its sole reliance on the oral technique of instruction. As the debate over learning strategies continued within Deaf culture, the Scranton School has joined with the Pennsylvania and Western Pennsylvania Schools for the Deaf, in adopting a "total communication" method that integrates American Sign Language and modes of learning tailored to the particular needs of individual students. Controversies over communication styles and deaf culture were highlighted recently in campus disputes at Gallaudet University and other institutions that serve deaf students. "Language and culture cannot be separated," one partisan observed. Within Pennsylvania's 501 public school districts a comparable transformation in state-regulated special education has occurred since 1976. As knowledge and expertise of alternative learning styles has matured, and as mandated educational entitlements have increased, it is now common to incorporate Individual Educational Plans (IEP's) in curriculum planning. In some respects, institutions like the Scranton State School for the Deaf pioneered this approach to individualized planning in the best interests of the student. Dorothy Bambach, The Courage to Lead: The Life Story of Rev. Jacob M. Koehler, Pennsylvania's First Deaf Advocate (Wilkes-Barre:: Let’s Go Publish), 2005. Douglas C. Baynton, Forbidden Signs: American Culture and the Campaign Against Sign Language (Chicago: University of Chicago Press), 1998. Jack R. Gannon, Deaf Heritage: A Narrative History of Deaf America. (Silver Springs: National Association of the Deaf), 1981.